If you want to have your gift delivered by December 24, place your order online by December 22, 3pm. In case you are ordering after this date, you can still have your experience gift delivered by email or you may pick it up personally at our office in Sheung Wan on December 24 and 25, 10am - 2pm. 1) What is an Experience Gift? Experience Gifts are a new way of gifting. You may pick any of Spoilt's activities as an experience and give them as a gift to celebrate your friends' birthdays, anniversaries, Valentine's Day or other special occasions. 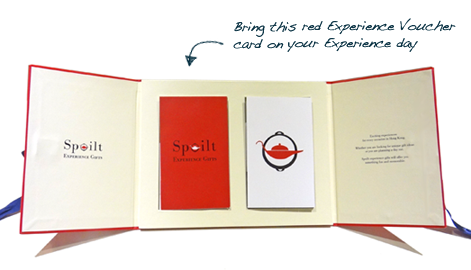 2) What is included in the Spoilt Experience Gift pack? Each of our gift packs includes a Gift Voucher, a personalized Message Card, an Experience Description Card and instructions on How to Book an Experience. 3) What is the validity period of a Spoilt Experience Gift? All Experience Vouchers and Gift Cards are valid for six months from the date of purchase. You must book and use your Experience before the expiry date. 4) Can I extend my Experience Voucher? Your Experience Voucher is still within its validity period. An extension will incur a charge of HK$200 for a six month extension. The new validity period begins on the day the extension is purchased. The original Voucher will become invalid after an extension has been purchased. A new Voucher will be issued with the new expiry date and a new voucher code and will be delivered to you by electronic mail. The extended six month period will begin on the day that you purchase the extension. If your Experience Voucher has expired but you are still within 30 days of the expiration date, you may extend a further six months with a charge of HK$200. The new validity period will begin on the day of the Voucher’s original expiry date. If your Voucher is expired more than 30 days after the expiration date, the extension fee will be charged at HK$200 per six-month period or part thereof after the original expiry date. If the price of the Experience has increased at the time of Voucher extension, you may also be required to pay the difference in price. 5) Can I exchange my Experience Voucher with another Experience? The Experience Voucher is still valid. After the voucher has been exchanged for a different Experience, the expiration date will remain unchanged. Please note that your Experience must be booked and used on and before the Experience Voucher's expiration date. You can only exchange your Voucher for a different Experience before you have confirmed a booking for your original Experience. You are welcome to exchange your voucher for any Experience on Spoilt or our sister company, Red Packet. An exchange is free of charge if you exchange your Voucher for Experiences of lower or similar value. If you choose to exchange for an Experience of higher value, you will be required to pay the difference. The value of the Experience will be determined by the price as published on the Spoilt and Red Packet website on the day the exchange request is submitted. 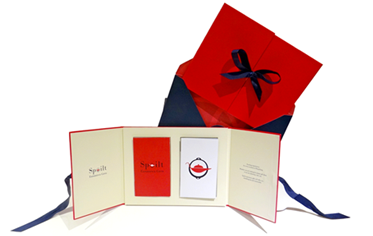 Once the exchange request has been approved, you will be issued with an electronic Experience Voucher for your new Spoilt Experience or a Red Packet Gift Box for your new Red Packet Experience. Exchange policy does not apply to Spoilt Gift Cards. 1) What if I can't decide on what Experience to pick? If you can't decide what Experience to pick, you may choose a Gift Card. 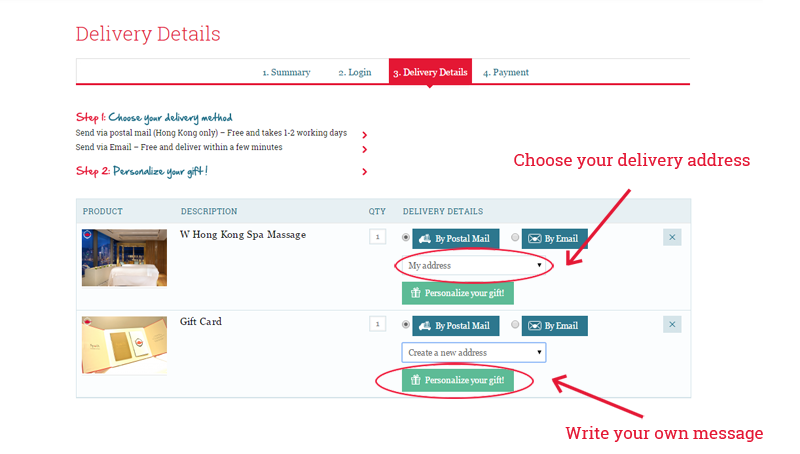 You can create a Gift Card of any amount, starting from HK$500. 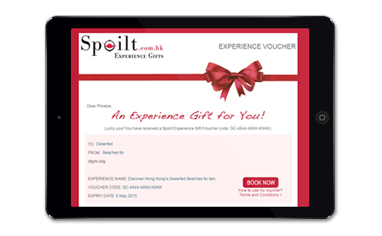 The recipient can then use the cash value of the Gift Card to buy any Experience from Spoilt. If the recipient chooses an Experience whose price is greater than the value of the Gift Card, he/she will have to pay the difference. If there is any remaining value left on the Gift Card after an Experience has been bought, it may be used at any other time within the Gift Card's validity period. 2) My gift is for a special someone. Can you make my gift more romantic? We have a Send with Flowers option for this very occasion! You can surprise your special someone with 6 fresh beautiful roses to go with your experience gift. 3) Can I buy multiple gifts at the same time? Yes. Whether you are buying for multiple recipients or buying multiple experiences for one lucky person, you can buy all of your gifts during one transaction. During the checkout process, you will be able to customize each gift with a message for the recipient. The whole process is very easy, add the address into your address book - "Create a new address". You can then assign each Experience to different gift recipients and customize your messages. For more about the checkout process, please click here. 1) What is the difference between Experience delivery by e-mail and by postal mail? Delivery Time: If you place the order by 3:00pm, the Experience gift pack will be delivered by 5:00pm on the next working day. Credit Card through PayPal - We accept all major credit cards, including Visa, Mastercard, American Express. Credit card payments are processed online using Paypal. Bank Transfer - You can transfer money directly into our HSBC bank account (Account Number: 808-594113-838 Account Name: Spoilt Ltd). Please include your order number and contact details in the transfer notes. Cheque - Please make your cheque payable to "Spoilt Limited" and send it to Spoilt Limited, 22/F B, Tern Centre Tower 1, 237 Queen's Road Central, Sheung Wan, Hong Kong with your order number and contact details. Please note that your Experience Voucher will only be dispatched once full payment has been received. 3) Is my personal information safe when shopping online? 1) Does the recipient need to book Experience gifts soon after receiving it? All Experience Vouchers have open dates. Subject to availability, the recipient of the Experience Voucher is free to choose a date and time that is convenient for him or her. All bookings must be made before the Voucher expiry date. 2) How do I book my Experience? To book your Experience, you may first click Book your Experience on our homepage. From here, enter your gift voucher code and register it to your account. You will then be able to select your dates and submit your booking request. 3) I received my Experience gift. What are the things I should be aware of? You must book and use your Experience before the expiry date. Please note that our Experience Partners may have their own booking and cancellation policies. We advise you to check carefully before you submit a booking request. Some Experiences have restrictions in terms of physical suitability (e.g. age, height, weight, medical restrictions). Please check that you meet the requirements before booking your Experience. If you have confirmed an Experience booking but do not meet the Experience Partner's requirements, you can transfer the booking to another person or you may forfeit the value of the Voucher. 4) What if there are changes to the Experience before I book it? Don't worry, we will notify the gift buyer/recipient if there are any changes to the Experience they received. If an Experience has been suspended or is no longer available, you can exchange it for another experience. 5) Can I bring friends to enjoy my Experience gift? Some Experiences can accommodate additional guests, subject to capacity. You may pay for your additional guests when you submit the booking form. Electronic vouchers will then be issued for your additional guests. You must bring these vouchers along with you to the experience as payment to the Experience Partner. 6) What if I booked an Experience, but have to cancel? Once you have received a booking confirmation, cancellations and rescheduling are subject to the cancellation policy found on the relevant Experience Description Details for a particular Experience. 7) I tried to make a booking online, but the website kept redirecting me back to My Account Information page. What should I do? Sometimes, cookies may affect the way a website is displayed. Try clear the cookies on your browser and try the booking again. If you are still encountering problems, feel free to call us on 2882 4881 or send us an email on hello@spoilt.com.hk. 1) What do I need to bring on the day of the Experience? 2) What happens if there is bad weather on the day of my Experience? 1) Can I tailor make an experience? Yes, if you would like to customise an experience, you can contact our Events team by filling in our enquiry form or calling us at 2882 4811. 2) Can I give these as Corporate Gifts? Yes. As part of our Corporate Services, we offer a variety of corporate solutions to keep your employees and VIP clients engaged. If you are looking for unique Experiences as your Corporate Gifts, please contact our Corporate Services team for more details. 3) I am looking to organise a party or corporate team building event. Can Spoilt help me? Of course! We organise parties all the time. If you are looking to have experiences at your birthday celebration, wedding or bespoke event, visit our Events website or contact our Events team. If you are interested in team building events, corporate entertainment or corporate wellness programs, visit our Corporate Services page or contact our Corporate Services team for more information. 4) How do I know if the Experience is good? Over the years, we have developed a list of criteria to ensure that our Experiences are of the highest quality. We only work with Experience Partners who are passionate about providing memorable and quality experiences and we are constantly working with them to ensure standards are maintained. Rest assured, each experience has the Spoilt quality guarantee! 5) Can I get a refund if I am no longer interested in the Experience? Once we have issued an Experience Voucher we do not offer any refund but you can exchange your Experience. For details, please refer to our Exchange Policy. Still have questions? Contact us now, the Spoilt team would love to help! Call us at +852 2882 4881 or email us on hello@spoilt.com.hk.